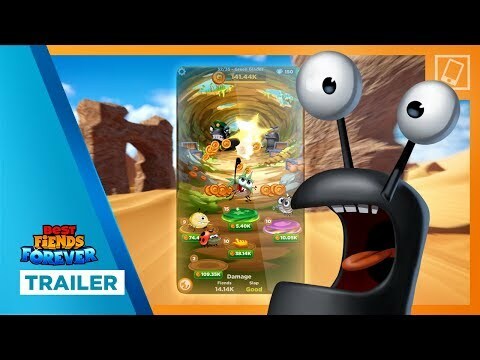 Best Fiends Forever is a Free-to-play, Mobile Casual Game For mobile devices. Get ready for the very big adventure with very small heroes. The sequel to the award-sometimes-winning-and-if-not-we’re-just-happy-to-be-nominated Best Fiends but it’s nothing like that game. The Fiends finally made it to Mount Boom, only to be defeated and imprisoned in very similar boxes. Now it’s time for YOU to turn the tables! Round up the old gang, level them up and defeat wave after wave of slugs as you make your way to the elusive villain behind the Slug Invasion. With the help of the Fiends, and the awesome reckoning power of Mount Boom, and the magical souvenirs that boost your strength, and whatever new stuff we come up with down the line, you’ll save the world in no time. And then realize there’s more to this game than even that! And then hate us for making a game you can’t stop playing. And there’s no energy mechanics, you can play it whenever you want, for as long as you want! Which is good, since you’ve obviously got some time on your hands if you bothered to read this far through the description. So get it already.